Large residential project utilizing rock-filled gabion retaining walls and 200+ tons of locally-quarried granite boulders to stabilize the site's steep slopes. A drought tolerant, pollinator friendly, + deer resistant entry garden frames a permeable paver driveway. A water-conscious permeable driveway is bordered by a showy perennial island of Anise Hyssop, Lavender, + Feather Reed Grass. Placed granite boulders add structural interest to a drought-tolerant entry garden of Lavender and 'Karl Foerster' Feather Reed Grass. A rock-filled gabion retaining wall system defines an interlocking permeable paver driveway, stabilizing the steep slopes + trees above. A stone-filled gabion bench with a concrete cap sits on a flagstone patio at the edge of the bocce court. Modern outdoor seating beneath shade sails forms a place to relax or watch a game of bocce ball. A modern outdoor living space for play + relaxation is situated at the front of the home. 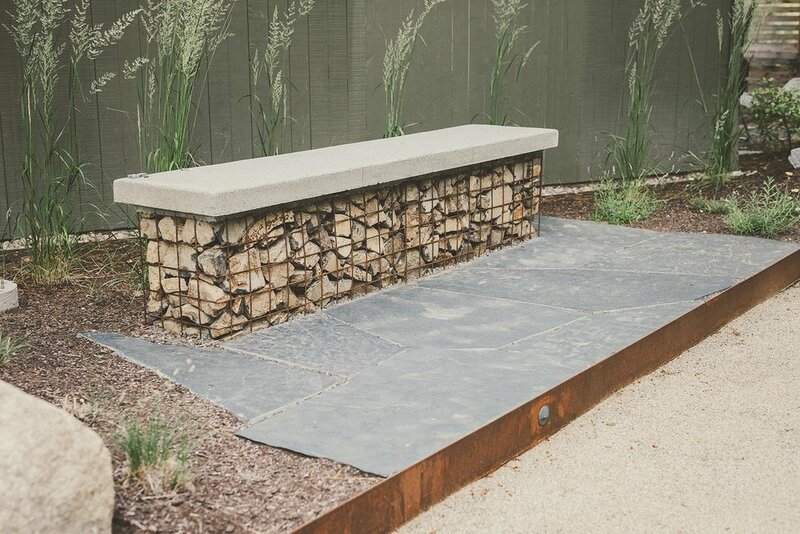 A concrete capped bench seat built into a gabion retaining wall system sits at the edge of a flagstone patio. A concrete capped gabion bench completes the arrangement of flagstone, COR-TEN steel, path lighting, + decomposed granite. Drought-tolerant Idaho Fescue [Festuca idahoensis] softens the COR-ten steel + granite boulder edge of a DG bocce court. LED landscape lighting allows for nightime play. 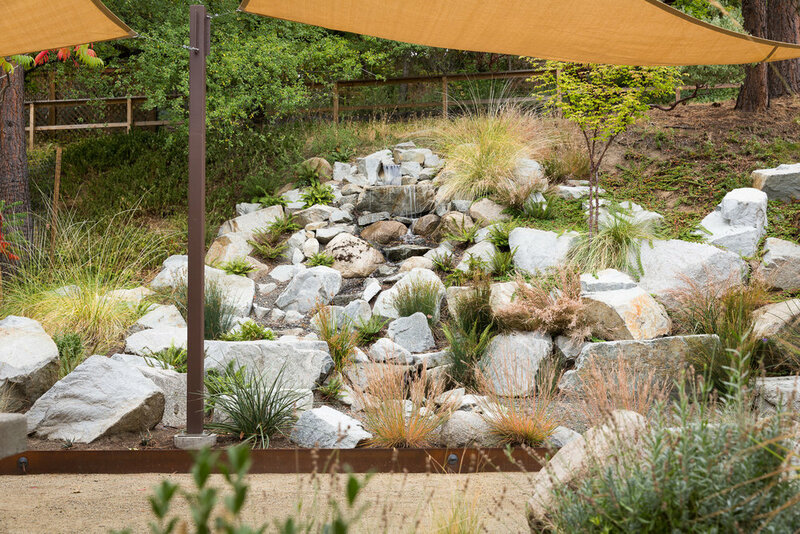 Locally quarried granite boulders form a water feature designed to emulate the sound of an alpine creek. Western Sword Fern, Deer Grass + Common Rush will continue to soften the edges over time. Western Sword Fern [Polystichum munitum], Deer Grass [Muhlenbergia rigens], and Common Rush [Juncus effusus] are planted in between large granite rocks and falling water. Locally quarried granite boulders form a cascading modern water feature with a steel weir at the top. Granite boulders and native plantings retain the hillside above an entertainment space. Slatted cedar privacy fencing creates a defined garden border along with the branches of a pruned Laurel hedge. A flagstone + gravel path curves through a forest garden of Madrone, laurels, + granite boulders. A flagstone and gravel path leads to a flagstone back patio bordered by stacked basalt retaining walls and a deer-resistant perennial garden of lavender and 'Furman's Red' Texas Sage [Salvia greggii]. An outdoor kitchen sits at the edge of the dining patio framed by curving stacked basalt walls, granite boulders, + deer-resistant perennials. A flagstone + gravel path contours a landscape of drought-tolerant + pollinator friendly perennial gardens + low basalt retaining walls. 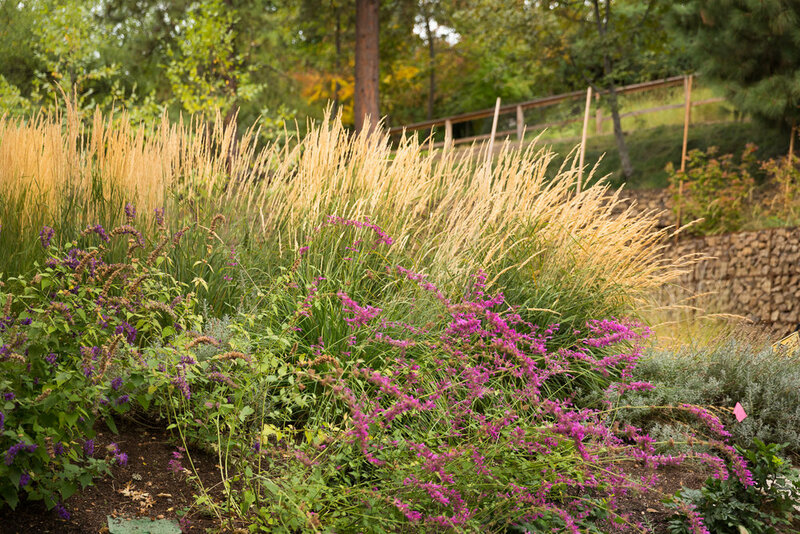 The leaves of an Paperbark Maple begin to fade to orange among tall, golden stalks of 'Karl Foerster' Feather Reed Grass and the gone-by blooms of summer Heather, Lavender, + Sage in this fall perennial garden. A modest wood fired pizza oven sits atop a custom concrete counter with firewood storage below. [SUMMER] A mixed landscape of basalt, concrete, granite + deer-resistant perennials frame this expansive back patio, looking out at the forested hills below. [FALL] A mixed landscape of basalt, concrete, granite + deer-resistant perennials frame this expansive back patio, looking out at the forested hills below. The curving line of stacked basalt retaining walls contours the backyard hillside. 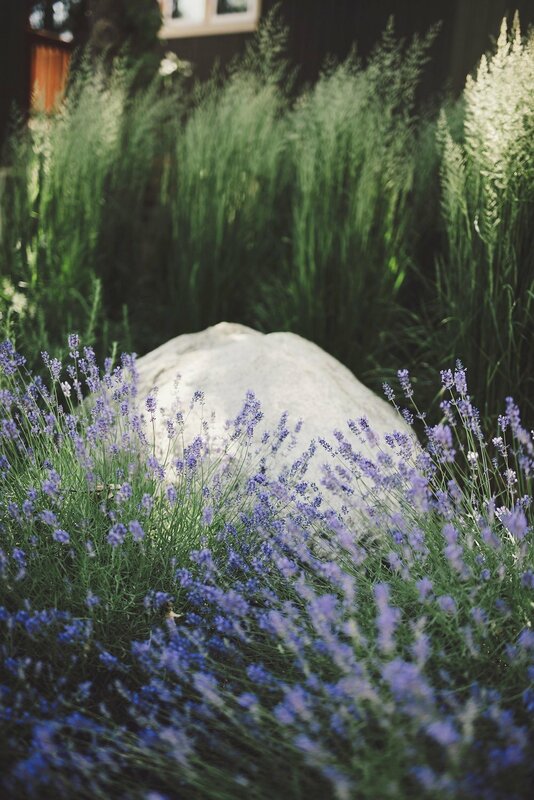 A local lizard enjoys the radiating heat from a granite boulder nestled within the lavender. 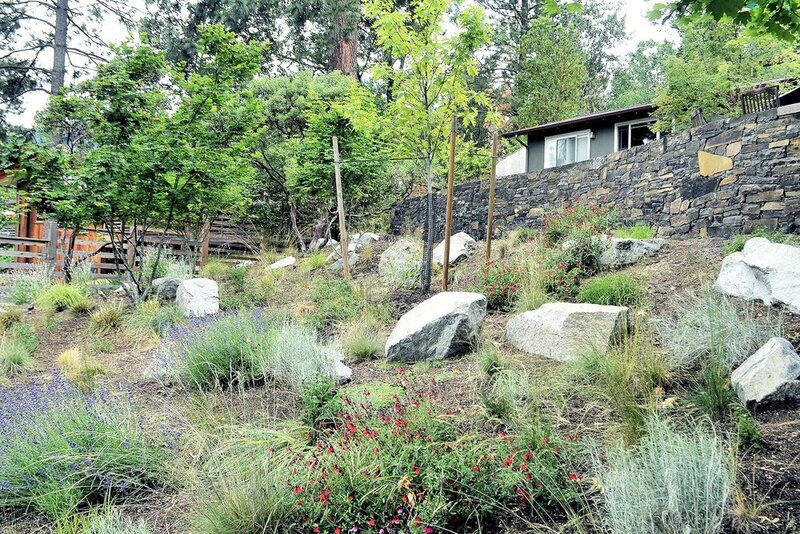 Below the stacked basalt wall + flagstone patio, a deer-resistant perennial hillside garden is formed by granite boulders, lavender, sages, and bunch grasses. A drought-tolerant perennial garden provides late season color + bee foraging w/ 'Flame' Red Sage, Rubber Rabbit Brush, + Lavender. A gravel pathway winds through native conifers and an understory of ferns + granite boulders. 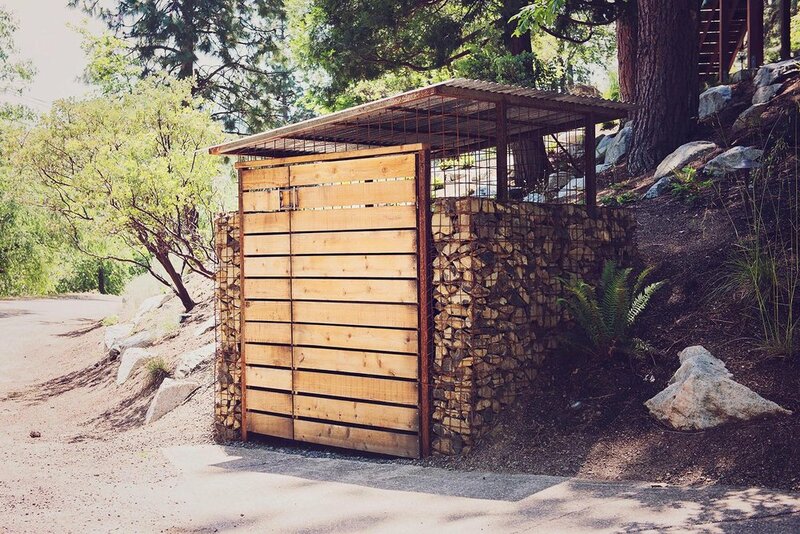 A gabion shed made of river rocks, steel mesh, slatted cedar + corrugated aluminum, provides modern curb side storage. This large-scale landscape design successfully addressed the challenges of a complex site and the owners' desire for a rich color scheme. A diverse materials palette defines the ambiance of spaces used for relaxation, play, + entertainment. Curving retaining walls preserve the integrity of the slope + protect existing native trees, while the planting design shows off deer-resistant varieties that attract beneficial wildlife and thrive with greywater irrigation. The permeable paver driveway and meandering flagstone pathways connect the property's COR-TEN steel bocce court, cascading granite water feature, natural stone dining patio, and bear-proof shed.